Scott Becker was sitting at a conference table conducting a work meeting when the lithium-ion battery that powers his e-cigarette exploded in his pocket. “It was like having a firework go off in your pocket,” said Mr. Becker, 46, of Washington Township. “I threw my chair back, I started hitting my pants and my hip. I saw the sparks shooting out of my jeans.” He suffered third-degree burns. Injuries like Becker’s are becoming more common, said Karla Klas, managing director for injury prevention and community outreach at the Trauma Burn Center at the University of Michigan in Ann Arbor. The e-cigarette batteries can explode with enough force to knock out teeth and crack vertebrae if they fail in the mouth of the user. “We’ve been seeing some pretty deep burns,” Klas said. Klas made a presentation on the topic at the American Burn Association’s annual conference last month in Boston. While she hasn’t heard of any deaths caused by an exploding e-cigarette, an informal poll of representatives from about 20 burn centers around the country tallied almost 300 recent burn cases that required hospitalization, she said. “Not only are the burns deep, but because of the chemicals that are in the batteries, it’s almost like they are having a chemical burn on top of the thermal burn,” Klas said. The Federal Aviation Administration banned e-cigarettes from checked baggage because of the fire risk. Vaping proponents insist the incidents are rare and preventable through proper use of the products and their batteries. Mr. Conley said he worries that exaggerated fears of fires could cause some people to avoid vaping and instead continue a deadly habit, cigarette smoking. But critics say the problem is real and it’s growing. “Even if it’s somewhat rare, these things are so dangerous that when it happens, these are horrific injuries,” said Wolfgang Mueller, a lawyer who has sued on behalf of three injury victims, including Becker. Mr. Mueller, who worked as a mechanical engineer before studying law, said an e-cigarette battery can short-circuit internally because of poor manufacturing or externally by coming in contact with metal in someone’s pocket, like coins, keys or jewelry. “That’s what makes it so important for these retailers and manufacturers to warn the consumer,” he said. Becker is an automotive engineer. He had purchased an e-cigarette with an LG battery in it and bought a second battery as a backup. On April 1, 2016, he slipped the spare battery into his pocket and headed to a meeting in Windsor, Ontario. “I was in a meeting at work and it started sizzling,” Becker said. The battery eventually burned through his pocket and fell spinning on the floor, filling the conference room with black smoke, Becker said. He ended up with a softball-sized burn on his right hip that took skin grafts to fix. His medical bills are more than $150,000. Mueller said he tried suing the store that sold the device and the batteries but found they had no insurance, so he’s preparing a suit against LG. E-cigarettes or vaping pens were first patented in 2003 and became available in the U.S. in 2007, according to a 2014 report by the U.S. Fire Administration. 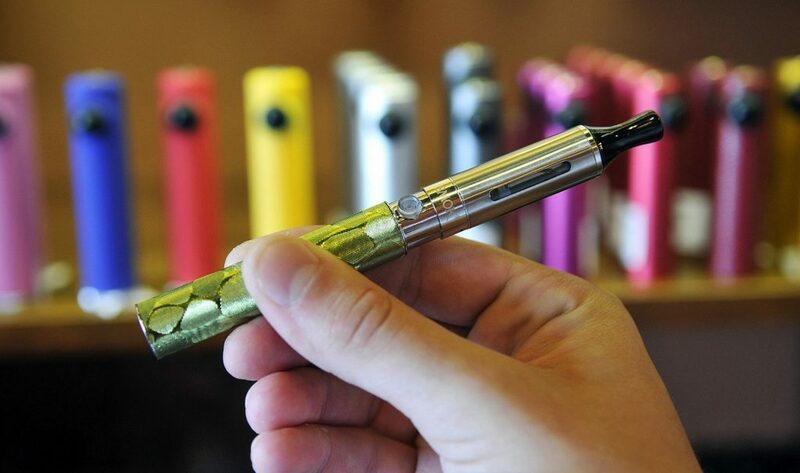 Users pour oils, which typically include nicotine, into the tank of the pen. With the press of a button, a built-in battery-powered heating element quickly heats the oils to about 400 degrees. At that temperature, the oils don’t combust, but they do form a vapor that can then be inhaled. While nicotine-laced chewing gum and skin patches had been around for years, e-cigarettes offered advantages for smokers looking to quit. They mimic the smoking experience and deliver the nicotine without creating the carcinogens associated with cigarette smoke. With about 44 million smokers in America, an estimated nine million to ten million people have used a vaping pen in the past 30 days, Conley said. “You have a product that has literally helped 2.5 million Americans quit the deadliest habit on the planet,” Conley said. But generating all that heat instantly requires a ready energy source and traditional disposable batteries run down quickly in the devices. Most vape pens come with rechargeable lithium-ion batteries and vape shops sell spares for when those run down. Lithium-ion batteries are so good at storing energy that they are used in cameras, power tools and even electric cars. The batteries carry about 20 percent of the power of TNT weighing the same amount, said Daniel Doughty, a chemist who worked for the U.S. Department of Energy for 20 years and now runs Battery Safety Consulting in Albuquerque, N.M. He noted that the batteries include aluminum foil on the positive electrode. “It gets hot enough to melt aluminum, which melts at about 1,220 degrees (Fahrenheit),” he said. He has examined many failed batteries to diagnose the problems.